Id have 3DMark 06 with both single and dual/tripple cards in the same table. It would also be cool with an Nvidia and ATI table. 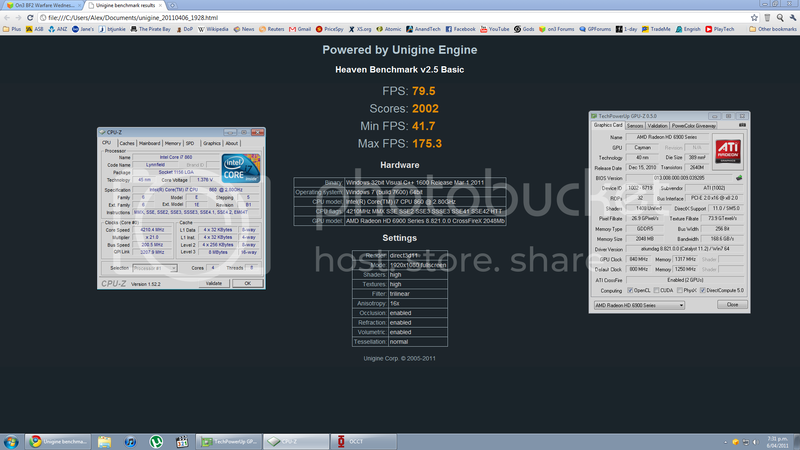 Like you said its very much a cpu benchmark so there's not much point to differentiate single from multiple cards. Im going to run the Crysis benchmark soon so ill post my result in a bit. I know, but it just says what settings i used without a summary. I've tried to run both as Admin and as standard user, but it doesn't work. Can't get to 1GHz on the GPU? so 925mhz is there max? i have seen some cards doing ~1050mhz with a little extra juice and cooling how much extra v have you fed them? 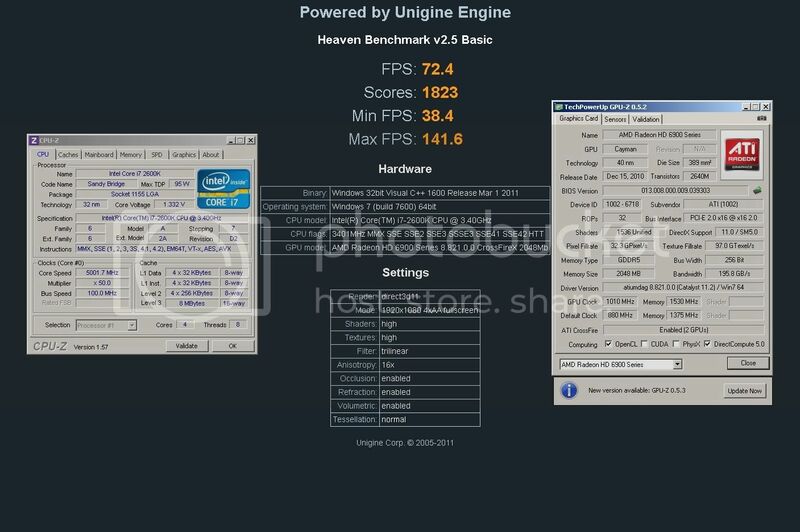 TBH my understanding is that on average a stock 6970 is a few percent below the GTX 480, so I'm guessing that Heaven must favour AMD hardware a bit given my relatively small O/C. Still, as you say it's satisfying to see the Red team be competitive, even if my heart is a bit green still lol. just had to take back my spot nothing personal. NO MORE! I say verily unto you shall we be at the mercy of drivers which "chugg", for a new day dawns and the sun which rises that day is Scarlet Red! The Greens dogs shall feel the back of my glove - mark my words! On the plus side it does 1004mhz so far no probs, but MSI does not recongnise the driver - so no voltage control there, yes I'v disabled ULPS in the registery, had to use Smart Docter for voltage of 1.25. Not my favorite programe. I shall join thee under the Scarlet banner soon. My EK block was shipped yesterday from Europe, so hopefully get it next week some time ready for a weekend install. Hows the temps going on it? Posting as it's my first score over 10k there is more legs in the setup but I'm still coming to terms with everything. Stock volts on the 6970 as I get artifacts with even the smallest volt increase in afterburner. Brilliant supam more ATI goodness! Improvement now that ram is sorted out somewhat. Interesting that the artifacts from overvolting are only in 2d mode. Challenge? :P I'm not even trying to get a high score lol, my cards don't clock very well. The best I can do without risking smoke. Raising the the bar for me all the time eh supam?